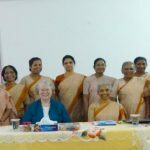 We, the ten SND tertians in India, are very grateful to our good and provident God for accompanying us in our journey of religious life as Sisters of Notre Dame. We are equally thankful to all our sisters who support us with their prayers. Seven of us tertians are from the Our Lady of Assumption Province, Patna, and three from the Our Lady of Visitation Province, Bangalore. We are privileged to do the one year of certificate course in Theology from the Institute of Mater Dei, Goa. On the 20th December we officially began our tertiate and the intensive preparations for our Final Profession. We are indeed blessed to have Sister Mary Sujita, a vibrant and spirit filled sister and guide, as our directress. 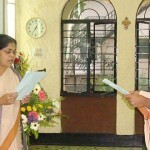 We officially began our tertiate here in Bangalore provincial house during our Christmas holidays. We have already completed two busy and fruitful weeks of our tertiate. Sister Mary Sujita took different sessions with us, leading us to get in touch with our own true inner self and to experience the personal love of Jesus for each one of us. Her inputs challenged us once again to make Jesus and his mission the center of our lives. Various sessions on personal life, community life and celibate life have enriched and energized us to go deeper in our response to the ever new call of God. It was a wonderful experience for all of us, especially for those of us from the Assumption Province, to meet so many of our sisters here and to enjoy their warm hospitality. Dear Sisters, as we continue on our journey believing in the goodness and providence of God and the intercession of Mary our Mother, we humbly ask you to bless us all and remember us in your prayers.